Equipped with translucent mirror technology, the Alpha 37 does not have an optical viewfinder, but rather a 1440-million-point electronic viewfinder. The system permits “reflex” autofocus phase detection in video mode, thus LiveView during video recording, as well as being able to see in the viewfinder the impact of various settings (white balance, exposure, depth of field, etc.). This new generation of entry-level digital reflex SLT cameras keeps the famous 16Mpix APS-C Exmor sensor, known for its excellent behavior at high sensitivities and in low-light, and for its high dynamic range. But the SLT-A37 is confined to a range of sensitivities that go from 100 to 16,000 ISO, whereas its predecessor went up to 25,600 ISO. It should be said that translucent mirror technology consumes part of the light that enters through the lens and thus results in a slight degradation of the camera’s sensitivity with respect to such other cameras as compact hybrids (for example, the NEX-F3 also announced today and equipped with the same sensor as the Alpha 37). 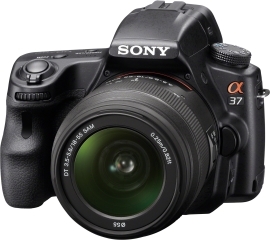 The Sony SLT-A37 can artificially double the focal length of a lens by cropping the image center, while limiting loss of image quality. Sony’s “By Pixel Super Resolution” technology extrapolates the image by attempting to reestablish the resolution, the details, and the subject. This type of process has been used in digital compact cameras for quite some time; now it has arrived for reflex cameras. This lightweight digital 2x doubler can help photographers avoid hauling around lenses while traveling. Many amateur photographers amateurs aren’t very successful shooting portraits for lack of proper framing. The Alpha 37 combines the intelligence of face detection with the “rule of thirds” (the golden ratio of photo composition), to come up with an optimal shot. To achieve this, however, the camera itself whittles down the image, although its By Pixel technology preserves some of the image quality. The kit composed of the Alpha 37 reflex camera body and the brand-new Sony SAL 18­–135mm lens, the world’s lightest at only 398 grams, is of particular interest for its multi-purpose use. The SLT-A37 body alone is 100 euros less expensive and better than its predecessor.